The Measures item of System Profile Preferences allows you to view, create, and edit, measures for a System Profile. Upon creation of a System Profile a set of default measures is subscribed. Measures in AppMon are metrics, or data points, collected and recorded in the AppMon Performance Warehouse either periodically or based on transactions. Measures are used for long-term charting, trend analysis, and as the basis for configuring incidents. Agent based measures (such as host agent and monitor measures) provide insight into your environment and infrastructure. These measures give accurate environment data points related to hardware, operating systems, servers, and databases. 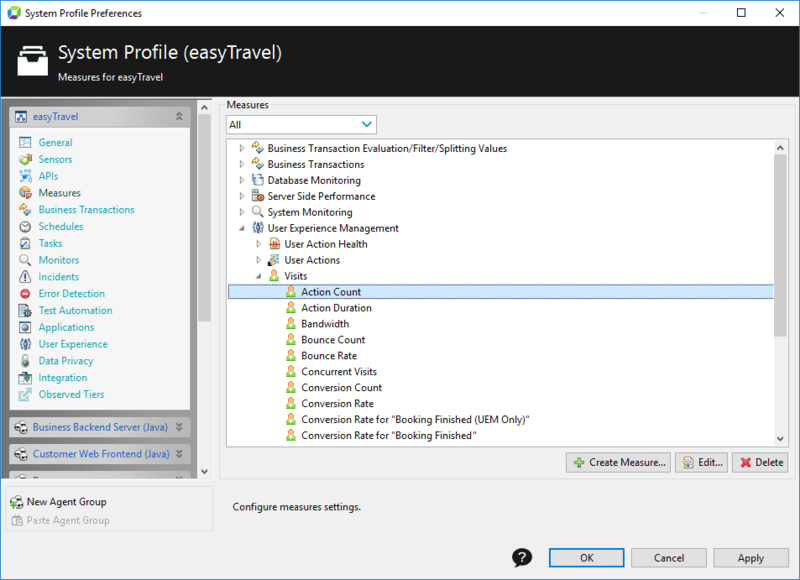 Transaction based measures give insight into your applications and transactions using PurePath information. You can copy measures or a group of measures between System Profiles. To search for a measure, press Ctrl+F, and type first letters of the measure name. To clear measured values for a measure, or for a group of measures, right-click it, and select Erase Data from the context menu. Select <System Profile> > Export System Profile > Search for <measures> to see all the measures. For a better experience, you can apply an XSL Transform to the System Profile XML (see sample profile.xsl with instructions). View Monitoring.profile.xml.htm for a sample transform.